Copics, pumpkins and coloring... what a wonderful thing. I really love coloring with my copics and when I came across this GREAT copic challenge at Copic Creations. I couldn't wait to get started. 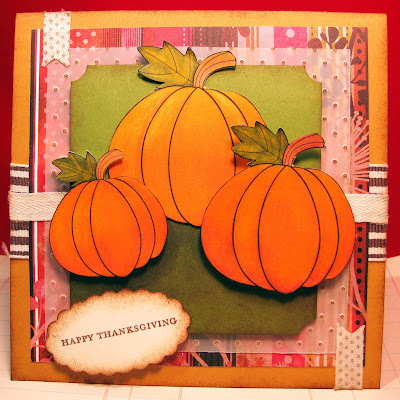 I didn't realize that I had a pumpkin stamp until after I bought this digital stamp. The copics I used are seen in this photo. Here is my finished product. I used the Basic Grey challenge for the sketch. I also kept The Pink Elephant challenge in mind as it is all about FALL!!! I used my Stampin Up paper for my solids and my Basic Grey for my designer paper, stampin up vellum, my copics as you can see above. The Happy Thanksgiving stamp is from SU too! I used a stamp set from PTI to put the poke a dots on my two small pieces of ribbon. This sketch from the Basic Grey challenge was a tough one for me. I am really happy with my end product. I hope it can send some inspiration your way. Posted by Jennine Chambers 4 inspiring thoughts! Holy cow!!! This blog candy is something else... eye popping HUGE! Craft International is giving away this amazing candy. Alzheimer's hit home for me. My paternal grandma passed away back in 86 after having been diagnosed with Alzheimer's for 7 years. This is not a disease you want to live with. They have come a long way in 23 years but there is still a long way to go. On a light note... Check out this blog candy for a chance to win~ Happy Monday! Here are a couple of cards that I created today for a few challenges. 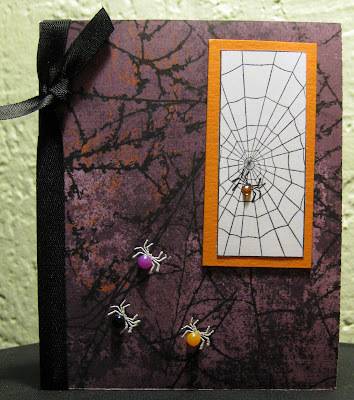 The spider card is for The Pink Elephants challenge this week. It was a color challenge. You can check that out here! 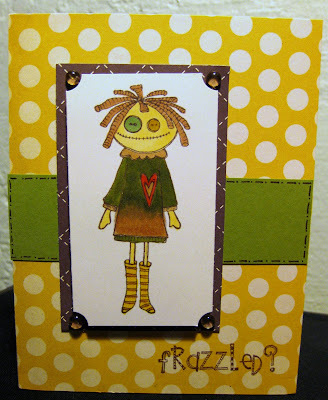 The frazzled card is for the Color Throwdown challenge (here) and Sweet Sketch Wednesday sketch challenge. Check them out... The Color Throwdown and Sweet Sketch Wednesday.